As I’ve previously written, I have some issues with Spotlight. That doesn’t mean, however, that I never use it. In particular, I use the Spotlight’s Finder search more often than the full-blown Spotlight search. As long as I’m relatively specific about what I’m looking for, the results are usually relatively quick and relevant. But there’s one thing I miss in the Finder’s Spotlight results that’s available in the full-blown Spotlight search results (when you use the Show All option), and that’s the ability to do meaningful sorting and grouping of the results. In the large Spotlight Results window, you can group the results by Kind, Date, People or Flat List (ungrouped), and then sort within those groups on Name, Date, Kind, or People. 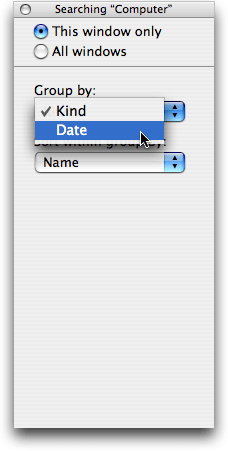 If you run a simple Finder search, though, such niceties are apparently missing. You can switch to List view (by pressing Command-2, or View -> as List), which will let you sort by one of the column headings, but you can’t sort and group using List view. 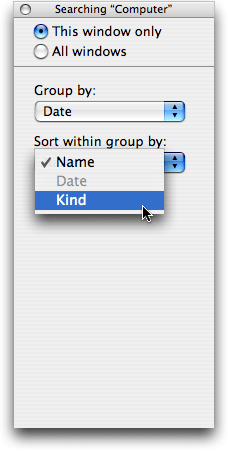 As you can see, you can group by Kind or Date, and sort by Name, Date, or Kind. While this isn’t quite as powerful as the grouping and sorting options offered in the Spotlight search results window, it’s better than not being able to do anything at all with the results.